Fenugreek is used as spices in the home. But it contains protein, vitamins and potassium that protect us from diseases. 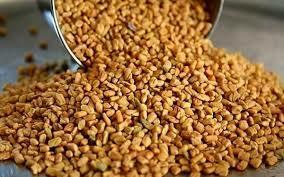 The daily consumption of one teaspoon fenugreek avoids many diseases. Acidity: Fenugreek balances the acid alkaline in the body. It is extremely beneficial for those who suffers with acidity. Weight Loss: Soaked fenugreek seed in water for overnight. Filter the water in morning and drink it. Also, chew the seeds. In a few days, the fat will reduce. Heart: Fenugreek seed has high amount of potassium that controls the sodium level in the body. This improves blood circulation and reduces cholesterol. Diabetes: Fenugreek contains amino acid that maintains insulin level in the body. This helps in blood sugar regulation and avoids diabetes. It is beneficial for diabetic patient to control blood sugar level. Clean the Body: Fenugreek removes toxins from the body. It contains fiber and anti-oxidants that improves digestion and avoids constipation.